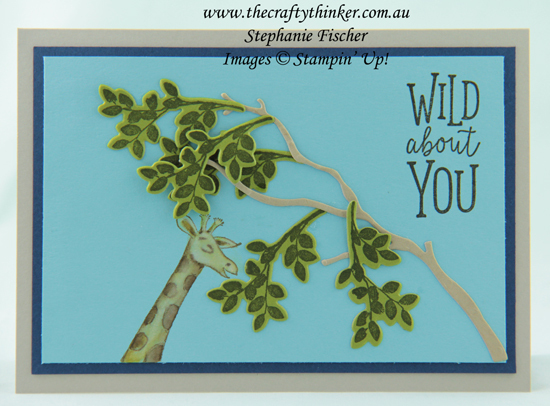 Well, I'll admit that when I received the Animal Outing stamp set as a gift from Stampin' Up at On Stage in April, I was grateful for the freebie but not "wild about" the stamp set and it has languished, unused, on the shelf ever since. However, it caught my eye while I was looking for something appropriate for my small great nephew's birthday card and suddenly the possibilities started rolling into my mind! I've combined it with the branch from the Seasonal Layers Thinlits and leaves stamped and cut out with the Rooted In Nature bundle. I never bought the Animal Friends Thinlits that coordinate with the Animal Outing stamp set and didn't feel inclined to fussy cut the giraffe, so I stamped him with Soft Suede ink directly onto the Balmy Blue cardstock. Of course, this created something of a colouring challenge - I didn't want an overly dark giraffe but, then again, nor did I want him to be green! Hopefully, he looks sufficiently giraffe-like!